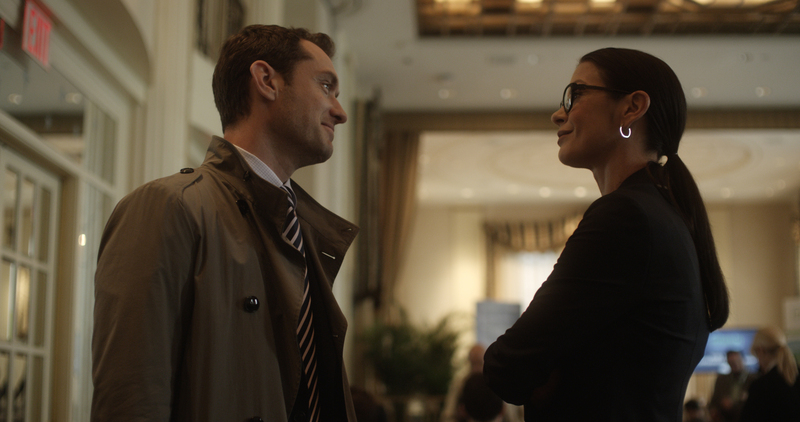 Jude Law and Catherine Zeta-Jones star in “Side Effects.” ©Open Road Films. CR: Barry Wetcher. HOLLYWOOD—When you marry an actor, you have to accept that your beloved likely will have to spend a lot of time smooching other people. The 43-year-old actress, who has coped with her own psychological stresses in the past—she revealed in 2011 she suffered from bipolar disorder following her husband’s throat cancer battle—plays a psychologist in the psychological thriller. Jude Law and Rooney Mara (“The Girl With the Dragon Tattoo”) co-star. Wearing heavy eye makeup and dressed in a short-sleeved black jacket and pants ensemble, the dark haired Oscar winner spoke about her newest role, motherhood and Matt Damon. Q: You play a psychiatrist. What did you discover about that field? Zeta-Jones: For me, playing a doctor, let’s just put it that I try and be as professional at the outset as one would think all good doctors are, but my character lies much deeper and the relationship between Jude and myself and Rooney and myself run much deeper than your first impression of me as a doctor would be. I’m thrilled that Steven cast me as a doctor because I never went to college and I always wanted an MD after my name. I’m really quite flattered that (he) fulfilled my mother’s dream. Q: You’ve used the British health system at various times in your life, so do you think this movie is a uniquely American story or could this type of plot could happen within the NHS? Zeta-Jones: For many years—it’s getting different now—but just from experience that I’ve seen and been part of, there was this British stiff upper lip where psychotherapy and depression and basically your emotions were quashed and it became that British stiff upper lip. Don’t put your dirty laundry out. Who cares about how you feel? You’re sad? Oh, buck up, you’ll be fine tomorrow. But now it’s starting to come much more in the open and people are starting to talk much more about it on television about issues. I think in America … it (is) much more public. People feel it’s just easier speaking about it, which I think is all good. I think speaking about all these issues is a very good thing. Q: What do you think this movie says about society? Zeta-Jones: I think culturally, we’re all victims to a quick fix, whether it’s texting or you want to see a movie you press a button and it’s on. Culturally, we want everything instantaneously. I think with prescription medicine, it’s the same thing. If there’s one thing you can take that’s gonna make all this go away then I’ll try it and if that doesn’t work, you see a commercial on TV and it’s like “Oh, I’ll try that. That seems a good one.” It’s become a cumulative that comes from a culture of quick fixes. Q: You’ve worked with Steven Soderbergh three times now. What keeps bringing you back to do his movies? Zeta-Jones: He rubbed my feet when I was pregnant in “Traffic,” and that’s the only reason why I keep coming back. He looked after a pregnant woman so well and I just knew I’d be in good hands. Q: Why did you want to be in this movie? Why did you want to tell this particular story and did it change your mind about anything? Zeta-Jones: Career-wise, and I love my job, but it takes me a lot to leave my kids and leave my husband and leave my dogs, so this had all the elements that got me straight on a plane the moment that Steven asked me to do this with Scott (Z. Burns’) script. All of the elements just fell into place. (It’s) a fantastic script; it’s a roller coaster ride. To work with Steven the third time was an absolute treat and to work with the caliber of actors that he cast so beautifully was a slam-dunk for me really. Zeta-Jones: Obviously, (the Rooney Mara kiss is) is a plot issue that I want to try and keep under wraps because I think for my character it’s a twist and turn, so I won’t speak of the beautiful (Rooney) (Kiddingly) I just wish she was prettier. She’s not funny. She’s not pretty. She can’t act. (She laughs.) Surely Steven could have done a little better for me. No, I’ve seen Liberace, “Behind the Candelabra,” and if my husband’s going to kiss anyone else in the world, I’m so happy it’s Matt Damon and not Rooney Mara. … When Matt Damon was kissing Michael, he closed his eyes and pretended he was kissing me. He said that to Michael. Matt was closing his eyes and kissing Michael and pretending he was kissing me, and I thought that was one of the biggest compliments I’ve ever had. (She chuckles.) It’s so screwed up. This is why Steven employs us because we can be screwed up as much as we want but just happy to be there on that day. Zeta-Jones: Like I said earlier, I find it really hard to leave my children. I think I’ll never get these beautiful, formative, delicious years back, and it takes me great thought and like I said, what is it I want to leave my kids and my husband for. This, obviously, was a must for me and to work with Steven for the third time. I’d pretty much do the phone book with him if he asked me. Just read it—in three different languages: French, Welsh and English. And then (producer) Lorenzo (di Bonaventura), he’s an old—not that old— but a dear friend. I saw (his 2010 action comedy) “Red” and thought it was a blast with an ensemble cast of (John) Malkovich, Helen Mirren, Sir Anthony Hopkins and Bruce (Willis) and Mary-Louise (Parker). (Doing the sequel) made sense to me. That sounded like fun. It’s on a completely different level to what this movie is. It’s completely different. I look for those movies that I can surround myself with great people and I know I’d love turning up to work everyday. Q: We hear you’re going to be part of a special musical tribute at this year’s Academy Awards show. What can you tell us about that? Zeta-Jones: They released that? Well yeah. (Turning to the movie’s psychiatrist consultant on the panel) I’ll speak to you, doctor, after because I’m absolutely terrified about that. That would be great. I don’t quite know the exact capacity to which I will be … I’ll be there, put it that way. I don’t quite know exactly what I’m doing. That’ll be fun.